It seems like everytime you turn around there’s yet another marketing dashboard. On one hand, it’s great having all your data in one, centralized spot. Pulling up a window or an application and visualizing your most important KPIs is an easy way to stay updated in real time. But on the other hand, what do dashboards REALLY do for you and your business? They provide information in a pretty user interface. But if the data changes drastically one day to the next, you don’t know what exactly you need to change, or what you should be doing to positively impact your business. You need multiple employees on salary to constantly scrub the data to provide insights that may take a week or more to arrive at a specific, actionable conclusion. By that time, the lay of the land could be completely different, you’ve wasted valuable time and resources, and may have totally missed an opportunity. As marketers are more and more being charged with revenue growth, they need to be ahead of the game when it comes to predicting what trends will become popular, what channels may be effective within their vertical, and where to steal market share from competitors. The only way to do this efficiently is with the use of predictive analytics and advanced mathematics. 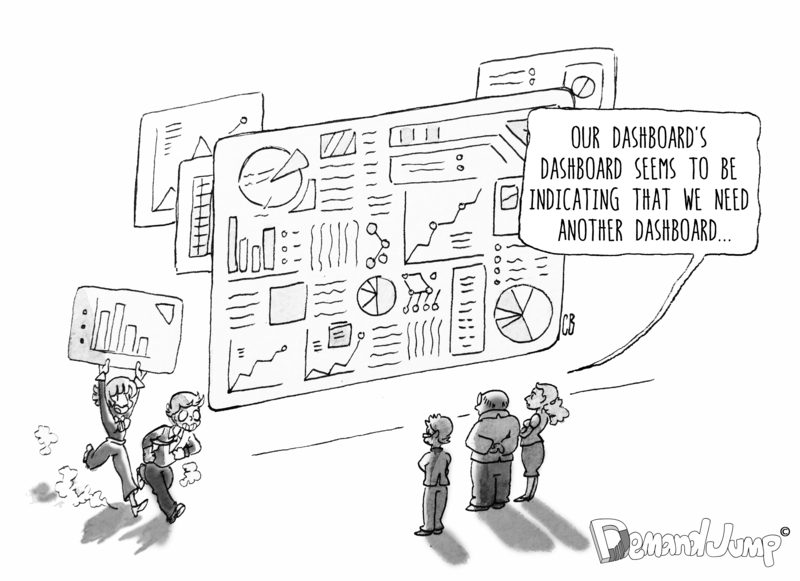 Dashboards have a place in the marketing world, but they really should not be the only input used to inform strategy. Today’s dashboards are based on historical data. It’s important to monitor, iterate, and make assumptions using past performance metrics, but we can’t anticipate the future to play out exactly as the past. And the truth is, you’re right. We never know with absolute certainty, but the fact is, when it comes to analytics, using only historical data is like shooting at a moving target with a blindfold on. You might know where that target was but you don’t necessarily know where it is. The time has come for something better. Advanced mathematics and modern computing now allows us to make better-informed decisions about what to next. Analytics shouldn't just be a visual representation of where we’ve been, it should be a living, breathing organism, capable of hunting down the best opportunities for marketers. By examining the complex properties of relationships, social signals, trending topics in content, competitive data (both direct and indirect), and more, DemandJump is able to identify where marketers are winning and losing, and predict, in real time, what channels and investments will deliver the greatest results. Real world data needs to move beyond spreadsheets and dashboards… reality is far more complex. The DemandJump AIM platform has built an Artificial Intelligence Marketing (AIM) platform that links all marketing signals into a dynamic knowledge graph that powers all its forecasts and recommendations. It’s not a dashboard. It’s a brain.